One side of the media, especially the legacy media, wants us to see the tragedy as a reason for gun control. The other seems to see Parkland as a convenient tool to hype School Choice, on-line learning, and supposed ‘local’ solutions to federal government tyranny. No one seems to want to eliminate the media’s ability to frame how we see Parkland and what we believe the solutions to be. Since the transformation vision relies heavily on misunderstanding the nature of learning standards like the Common Core or Competencies (Inside-Out) and also not reporting the long planned convergence of the media and education to create the narrative driving a perceived need for change, let’s tear away the shroud obscuring this cooperation. Likewise, when that GEFF report headlines its “New Horizon” chapter with this Margaret Wheatley quote, think not just of the roles of the media and a new type of learning, but also all the high school students we are now seeing who simply assume a right to redesign the world and existing systems. That shift is much easier if, unbeknownst to most parents, the schools have long since shifted from a subject-centered curriculum to an ‘experience-centered curriculum’. Suddenly, topics, themes, concepts, and principles come first to provide students with a means to “intellectualize his experience.” To mine my personal library using a post WW2 book called Reorganizing the High-School Curriculum from 1947 to move away from the school as “merely an instrument for perpetuating the status quo” to one where “our democratic society is to be refined and re-created,” would require a new type of education grounded in a new theory of learning. That’s what student-centered learning is really about and everyone involved with education reforms, except students and parents, is either openly or covertly pushing this same vision. If we miss the planned role of all media in this, we are fighting a battle with blinders on. That was sixty years ago, but only the names and tools change, not the transformative aims. https://ssir.org/articles/entry/using_story_to_change_systems has a similar aim and came out about a week ago. Also recently the Data & Society Research Institute issued a report called “Dead Reckoning: Navigating Content Moderation After ‘Fake News'” that caught my eye. One thing about tearing a tendon in your leg, I have been rather stuck watching bad TV like it or not. A publication like that wanting to define what is Fake News not by veracity of the information but rather or not the source is preapproved by the powers that be simply emboldens the lies I have been forced to watch recently on the evening network news. The difference though was I was in a position to find out more of what looked like immunity to lie to advocate for the repeatedly announced “public” or “societal transformation” as I was signed up to attend a February 23, 2018 Georgia Bar Media & Judiciary Conference sponsored by CNN among others. The speakers, who included a Morehouse journalism prof, a New York Times reporter, a former CBS reporter, and the managing director of CNN International, kept hyping the role of the “Legacy Media’ to be ‘gatekeepers’, which to me rather smacked of censorship before the fact by approved sources. The CBS reporter, hyped “the crucial role of the press in shaping American history” and asserted that Facebook and Google’s recent policy changes to prefer the Legacy Media in search results were a good start but were “not enough”. I thought about how Walter Cronkite had so hyped the Tet Offensive that a generation of Americans thought we lost military ground then. They did not recognize a deliberate use of the news and what gets covered, to steer popular and prevailing consciousness on an issue. When the audience was asked for questions, I raised my hand and asked if their position was that the term “Fake News” was about the source of the information or the quality of the information? That’s when things got really interesting since no one knew education was my area of expertise. The response by several of the panel members was to agree it was about the source and the standards of truth used by the ‘legacy media’ and then begin to talk about the need for new curriculum in the schools to create deference to the Legacy Media. Another member then mentioned that the real solution to Fake News allegations was “further down the food chain in the schools” and called attention to a News Literacy Project that had been created to do just that. It would aid students to differentiate between Fake News and to know “what to believe.” That continued targeting of the internalized belief system that has always been a hall mark of Tranzi OBE under its various names (see last post and comments) got my attention. So I came home and looked up the Project and discovered it had been started in Spring 2008 by veteran reporters from the LA Times. The family that had owned the Wall Street Journal before Rupert Murdoch was also involved and Steve Schmidt who had worked in the White House under Bush 43 and who managed John McCain’s Presidential run. Mollie Hemingway, now a Federalist editor and contributor to Fox News is on the Board. Since she is married to a writer at the Weekly Standard I think we can conclude that the Legacy Media as well as the so-called non-establishment media that is supposedly conservative all want to create school curriculum on how the media is regarded. The really fascinating member of the Board in my mind who thoroughly conjoins media and education, learning standards and media literacy projects, and inside-out vs outside-in filtering to Consciously Create Consensus was Sam Wineburg. Wineburg is an education prof at Stanford who has been active in creating standards for “Civic Online Reasoning”. The Stanford History Education Group or SHEG is where everything comes together as they have created the Reading Like a Historian curriculum that can be used to create and measure the existence of the ‘desired understandings’ that students are to internalize as their required Higher Order Thinking Skills under federal ESSA law. 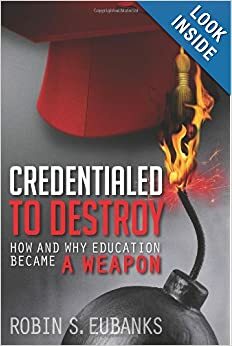 Doesn’t that sound like an excellent way to Consciously Create Consensus, especially if the curriculum gets used to create formative assessments that few parents will understand if they have not read Credentialed to Destroy? The News Literacy Project presented at both the 2016 and 2017 National Council for the Social Studies annual conference so we know these curricula will be used to create the C3 Framework ‘lenses’ to evaluate how students view the world around them. Turns out the nonsensical slogan that “we are teaching students how to think, not what to think” is actually not true at all. The Parkland and other high school students then are simply fulfilling the roles SHEG and other experiential curriculum have trained them for. The way out of students who see themselves as Makers of History is to recognize that school has neurally and deliberately rewired them to do, think, want, and act in preapproved ways. We are, after all, the Public whose consciousness the media, educators, and virtually every think tank I have looked at wants to control. We need to recognize the how and why and that it is not just students being targeted.